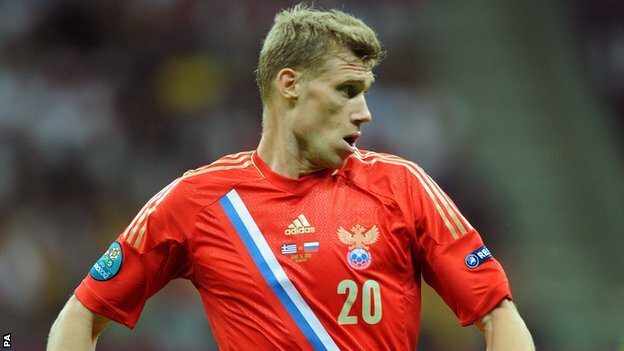 Pavel Pogrebnyak has received a shock call-up to Russia's provisional squad for next month's World Cup finals. The Reading and former Fulham striker, 30, has been named in coach Fabio Capello's initial 30-man line-up. The last of his 32 games for Russia came in June 2012 and he has never featured under ex-England boss Capello. Pogrebnyak, who has scored 13 goals in 39 Championship appearances this season, will know if he has made the final 23-man squad by 2 June. He is the only player in the pool who plays his club football outside Russia. and midfielder Diniyar Bilyaletdinov (Anzhi Makhachkala), who played for Everton, failed to make the squad. Russia are playing in their first World Cup finals tournament in 12 years and face South Korea, Belgium and Algeria in Group H.
Andrey Semenov (Terek Grozny), Georgi Schennikov (CSKA Moscow). Alexander Samedov (Lokomotiv Moscow), Victor Faizulin (Zenit St Petersburg), Oleg Shatov (Zenit St Petersburg), Roman Shirokov (Krasnodar). Alexander Kokorin (Dynamo Moscow), Pavel Pogrebnyak (Reading). 30-man 2014 FIFA World Cup Brazil™ squad, announced by coach Fabio Capello. Instead, Capello has called up veteran forward Pavel Pogrebnyak, 30, who is currently playing in the second tier of English football with Reading. and is unlikely to be fully fit in time for the start of the World Cup in June. the only Russian player to have appeared at the 2002 World Cup in Korea and Japan, and former Chelsea winger Yury Zhirkov. and Morocco on 6 June in a bid to expose his team to contrasting playing styles ahead of Brazil. and have been drawn in Group H along with Belgium, South Korea and Algeria. Goalkeepers: Doukha, M'bolhi, Si Mohamed, Zemmamouche. Defenders: Belkalem, Bougherra, Cadamuro, Ghoualm, Halliche, Khoualed, Mandi, Medjani, Mesbah, Mostefa. Midfielders: Bentaleb, Boudebouz, Brahimi, Guedioura, Karaoui, Lace, Taider, Yebda. Forwards: Djabou, Djebbour, Feghouli, Ghilas, Kadir, Mahrez, Slimani, Soudani. 羅力亞:Goalkeepers: Maximo Banguera (Barcelona, Ecuador), Adrian Bone (El Nacional), Alexander Dominguez (Liga de Quito). 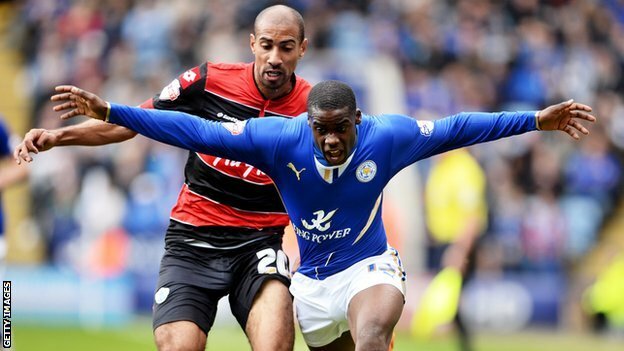 Leicester City defender Jeffery Schlupp has been picked in Ghana's preliminary 26-man World Cup squad. The Germany-born Schlupp has only one Ghana cap but his form helped Leicester win promotion to the Premier League. Helsingborg striker David Accam is another surprise inclusion, winning his place after a burst of 10 goals in 10 games for his Swedish club. Ghana coach Kwesi Appiah dropped a number of big names, including ex-captain John Mensah and Isaac Vorsah. while Asamoah Gyan and Sulley Muntari are on course to appear at the tournament for their third time. The Black Stars will begin training in Accra on 20 May before travelling to Amsterdam for a friendly against Netherlands on 30 May. Appiah says he will then prune down his squad to 23 players before heading to the United States of America for the final phase of preparations in Miami. their World Cup base on 11 June, five days before their world cup opener against USA. They will also face Germany and Portugal in Group G.
Jonathan Mensah (Evian), Jerry Akaminko (Kisehirspor), Rashid Sumalia (Mamelodi Sundowns). Emmanuel Agyemang-Badu (Udinese), Afriyie Acquah (Parma), Christian Atsu (Vitesse), Albert Adomah (Middlesbrough), Andre Ayew (Marseille), Mubarak Wakaso (Rubin Kazan). Strikers: Asamoah Gyan (Al Ain), Kevin-Prince Boateng (Schalke 04), Abdul Majeed Waris (Valenciennes), Jordan Ayew (Sochaux), David Accam (Helsingborg). Tottenham's Nabil Bentaleb has been included in Algeria's 30-man provisional World Cup squad. The France-born 19-year-old, who has only one international cap, is among eight midfielders selected by coach Vahid Halilhodzic. Only three Algeria-based players are in the squad, which will have to reduced to 23 men by 2 June. Algeria will face Belgium, Russia and South Korea in Group H at the 12 June to 13 July tournament in Brazil. Goalkeepers: Izzedine Doukha (USM El-Harrach), Rais M'bolhi (CSKA Sofia), Cedric Si Mohamed (CS Constantine), Mohamed Lamine Zemmamouche (USM Alger). Defenders: Essaid Belkalem (Watford), Madjid Bougherra (Lekhwya Club), Liassine Cadamuro (Mallorca), Faouzi Ghoualm (Napoli), Rafik Halliche (academica Coimbra), Nacereddine Khoualed (USM Alger), Aissa Mandi (Stade Reims), Carl Medjani (Valenciennes), Djamel Mesbah (Livorno), Mehdi Mostefa (AC Ajaccio). Midfielders: Nabil Bentaleb (Tottenham), Ryad Boudebouz (Bastia), Yasine Brahimi (Granada), Adlene Guedioura (Crystal Palace), Amir Karaoui (Entente de Setif), Medhi Lacen (Getafe), Saphir Taider (Inter Milan), Hassan Yebda (Udinese). Forwards: Abdelmoumene Djabou (Club Africain), Rafik Djebbour (Nottingham Forest), Sofiane Feghouli (Valencia), Nabil Ghilas (Porto), Foued Kadir (Rennes), Riyad Mahrez (Leicester), Islam Slimani (Sporting Lisbon), Hilal Soudani (Dinamo Zagreb). 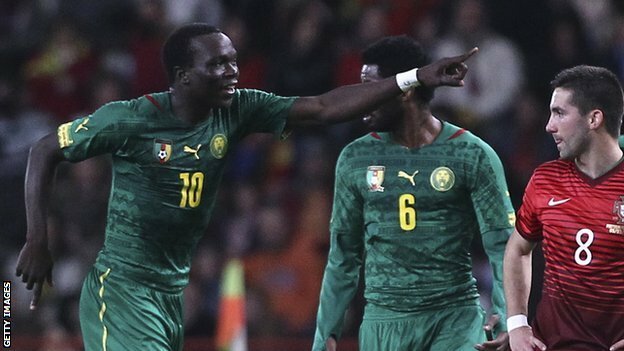 Cameroon coach Volker Finke has opted for a tried and trusted line-up in his 28-man provisional World Cup squad. The German has picked all but one of the group of players who earned the Indomitable Lions' place at Brazil with the play-off win over Tunisia. Striker Jacques Zoua, who plays for Hamburg, is the unfortunate man to miss out because of injury. Much will be expected of forward Vincent Aboubakar after his 16 goals for Lorient this season. That places him joint-second highest scorer in the French Ligue 1 behind only Zlatan Ibrahimovic. Goalkeepers: Charles Itandje (Konyaspor), Guy Roland Ndy Assembe ( Guingamp), Sammy Ndjock (Fethiyespor), Feudjou Loic (Coton Sport). Nicolas Nkoulou (Marseille), Jean-Armel Kana-Biyick (Rennes), Henri Bedimo (Lyon), Benoit Assou-Ekotto (QPR), Gaetang Bong (Olympiakos). Landry Nguemo (Bordeaux), Alexandre Song (Barcelona), Cedric Loe (Osasuna), Edgar Salli (Lens). Pierre Achille Webo (Fenerbahce), Mohamadou Idrissou (Kaiserslautern), Fabrice Olinga (Zulte Waregem).